It is important to remember that at all times we are feeding our frequency. What does this mean? Our energy systems are always changing and evolving with the input that we give it. We constantly nourish our mind body emotions and spirit with all that we say, think, feel, eat, see and do and we process all this data through our system whether it be biological, emotional, mental or spiritual. We do it on a subconscious level even though at times we feel we may be totally ‘aware’ of all input, but there are times that aspects of what we process are not always going to be completely clear as our eyes, brain input exceeds all we can process at this time. When I talk frequency, I talk light quotient or light particle mass within a structure. How much light is in that? This is the light that makes up the energy part of all that is on a molecular level. The higher or lighter the frequency, the lighter quotient makes up that structure. For example, with food, the closer it is to the state of the natural law, being purest form, like an organic carrot, the lighter or higher the frequency. It is natural, nourishing and gives, to replenish us. The brilliant Japanese scientist, Dr Masaru Emoto, who showed us how simply music, words and pictures shifted water molecules in different ways, gave us experiments that showed us how simply certain stimuli can affect water particles. The harshest most frenetic and disjointed music showed us erratic and malformed water particles, where the gentler, kinder, calmer music created beautifully shaped mandalas or flowers. 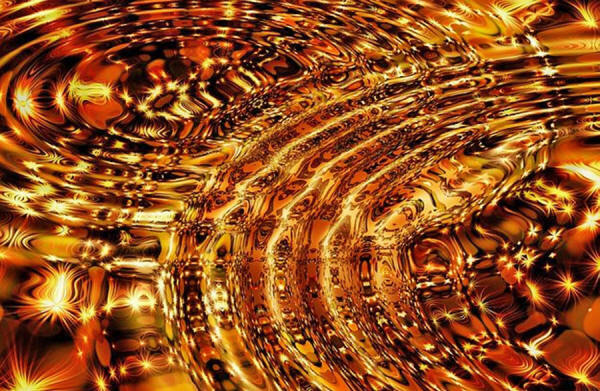 The frequency of the harsh music is heavy, and the light quotient is low which does not transcribe easily into the human cellular structure causing discord, with the gentler music, holding higher light quotient is able to transmit light into the water for an easy transcription. Frequency likes to flow. It likes a constant ease of motion which is usually a tri-wave meaning 3 bands of light. Take painting for example, when we use two colors to paint, we can mix them together to create a third, therefore it is constantly creating something new. This is what the tri-wave likes. It wants to create from a place within a structure already there. This is a give and receive frequency. An example of bi-wave in action is to see harsh music as an example. Some of the harshest sounds or most erratic music gives a sensation of discord within, awakening feelings of anger, confusion, rage or fear. These feelings are intensive and can overtake you, feeling more of a battle energy. These feelings give the music more power than it does you for you which you end up giving away your power to the music, leaving you feeling depleted. The bi-wave is you and the music. It does not create replenishment within, like that hit of coca cola. My disclaimer here is that there is nothing wrong with feeling these feelings for there is much stored within our systems that we need to experience and help heal and clear, but to evoke them and create them intentionally and regularly will only bring your energies down, circling in less light and more discord. The less light held within your system, the less connected you will become to your true power. When the tri-wave is in play, the sounds or music created with gentler format, gives rise to feelings of calm and peace. These feelings are created from within, naturally triggering higher healthier cellular renewal. As this light lifts you and your feelings, it returns into your cellular structure and shifts your DNA into creative energy. 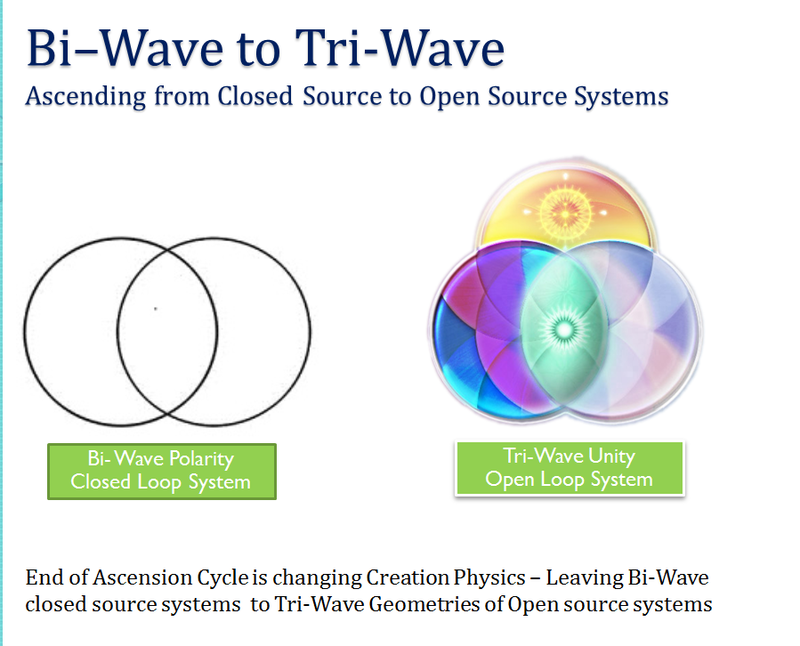 This is the tri-wave giving a continual cycle of nourishing, lifting energy and cellular health which is all created from within, allowing us to feel healthier and happier. It is here in these feelings of love and fulfillment, we can create our most magnificent life. Music is but one example of how we give our power away. As we know, things like the news, social media, reality shows, newspapers, movies, songs are created from a lower frequency, the bi-wave, to connect you to the fear. Here it is easier to take the power that you give so easily, to evoke these feelings of fear within you giving rise to a hit or addictive style of feeding. We give power to that upon which we focus. And yes, there are still those things in our world that we perceive to be tragedy, there is suffering, pain and heart ache at this time. There are movies that will continue to be destructive, harsh and angry, music and musicians that yell fear into their microphones, producers creating shows that pit people against one another, and of course we are human so these things are always about, so the choice lies with us as it always has. There too is so much love, kindness and compassion in our world and we have so much to choose from, and when we choose for ourselves, we shift for all. I know that life is exactly as it should be and all that is here and now is how it is meant to be for us to take the next step into our evolution or ascension. Remember God does not test us. Source does not judge us. We have always had free will. We can choose to nourish the frequency that feeds us in every possible way.